The ABC – Activity Based Costing – method supplements traditional accounting approaches by enabling companies to analyze costs by process and activity. The ABC model makes the full cost of products and services understandable. For this reason, it is establishing itself in a growing number of sectors and companies as a tool for gaining a detailed understanding of the value chain, managing costs, and taking both strategic and operational decisions. There is no absolute truth when it comes to assessing the full cost of a good or service. Current practice consists of justifying sales prices with reference to cost prices based on figures arrived at through accounting procedures. However, cost accounting data are established according to accounting conventions, which are always open to question. Placing too much confidence in these figures can therefore lead to serious errors of management. What can be done to avoid these rigid approaches that are set in stone and give an illusion of true cost? 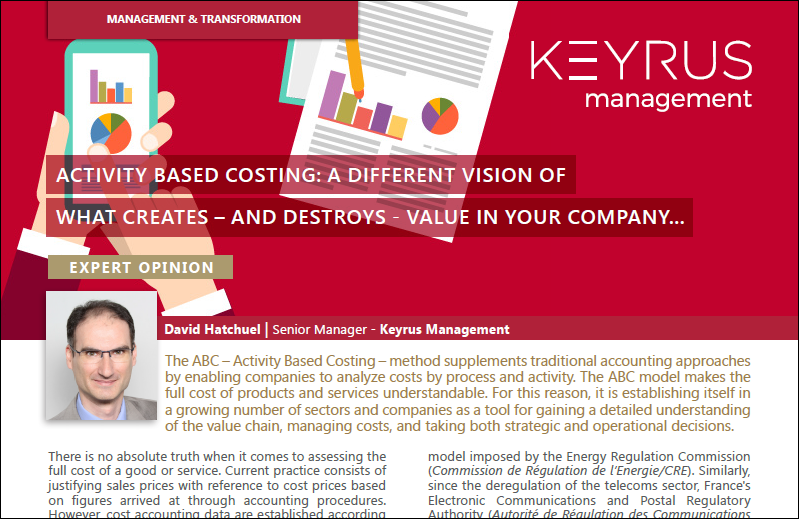 The ABC/M (Activity Based Costing/Management) method makes it possible to shift from an accounting view of performance to an economic one, centred on the value chain and the customer. It relies on looking at costs by process and activity, and apportioning them in a multi-dimensional way to products, customers, and distribution channels. By providing a process-based vision that cuts across the organization, it supplements traditional cost and profitability analysis and aids strategic and operational decision-making. By adopting, or drawing upon, a standardized ABC model, you avoid starting from scratch, leave nothing out, and, above all, can measure yourself against other companies. The fact that certain sectors' regulators have made it mandatory to use an ABC model to calculate and set out the cost prices of their products and services. For example, EDF is required to come up with the cost prices for electricity according to the ABC model imposed by the Energy Regulation Commission (Commission de Régulation de l’Energie/CRE). Similarly, since the deregulation of the telecoms sector, France's Electronic Communications and Postal Regulatory Authority (Autorité de Régulation des Communications Electroniques et des Postes/ARCEP) verifies operators' production costs calculated according to a standardized ABC model. In 2010, when the gaming and betting sector was opened up to competition, France's Online Gaming Regulatory Authority (Autorité de Régulation des Jeux En Ligne/ARJEL) required longstanding players to set out their online betting activity in separate accounts. Some of the sector's operators foresaw this requirement and managed to convert it into an opportunity, by using the ABC model recommended by the ARJEL to help them manage the performance of their internal processes, products, and distribution channels. The role played by professional/sectorial organizations has also been decisive in the adoption of the ABC method. A number of the IS departments of major French companies use the Cigref IT cost analysis and benchmarking model. This ABC model provides a classification of services commonly rendered by an IS department and draws the link between costs and cost drivers. By tying costs to levels of consumption it makes it easier to re-bill services internally, and by standardizing services it enables companies to compare their IT costs.In the same vein, the Association of Finance and Management Controlling Directors (Directeurs Financiers et de Contrôle de Gestion/DFCG) promotes a costs and benchmarking model with a repository covering 16 cross-cutting functions, 220 activities, and 62 work units. It aims notably to make it easier to define the SLA and calculate the prices at which services rendered to the various organizational entities are re-billed. The diversification of distribution channels and the omnichannel behavior of customers. These changes, as well as the growing portion of product and service costs that is indirect, makes it much more complicated to measure the profitability of products and customers. The ABC method makes it possible to closely monitor the full cost of a given product by taking into account the various costs inherent in each distribution channel/method. If more and more companies are now turning to Activity Based Costing, this is certainly sometimes down to regulatory requirements, but above all else it is done to identify new levers for controlling costs and improving profitability. This initiative can be limited to one function, such as IT, but it comes into its own when it covers the whole company, in other words, all its processes and activities. This is the case for France Télévisions which, to supplement its management system, developed an ABC model enabling it to optimize resource allocation, monitor the cost prices of its programs, and manage the overall performance of the group's entities. Indeed, one of the major benefits of a costing project is that it creates impetus and breaks down organizational silos by bringing finance personnel and operational staff together around the table. This is essential if we want to end up with appropriate repositories and apportionment rules that are understood and accepted by all involved. Uniting the various stakeholders around a common model allows each of them to better understand his or her costs and profitability and manage his or her own activity more effectively. In this way, the marketing director can rely on this model to adjust his or her pricing strategy. Similarly, a sales director can identify new trade-off criteria to balance his or her customer portfolio. Solid endorsement by management and the setting up of a multidisciplinary project team. If the Costing project is to be a company project, it is essential that the CEO expressly support it from the moment it is launched and at all times while it is underway. The multidisciplinary makeup of the project team, bringing together management controllers and business managers, ensures that no aspect or process will be left out of the design of the model and management rules. Due account being taken of change management very early on in the project is also essential, so as to explain to those involved the purposes of the project, its stages, what the deliverables will be, and what results are expected from it. The design phase is the moment par excellence for operational staff to make their contribution, understand what ABC can bring for them, and make the initiative their own. Whilst it is important to open this stage up to many people, it is also advisable to confine it to a short time period. It is better to build an initial model, put it to the test, and develop it on the basis of results achieved, rather than trying to build a "perfect" model on the first attempt.< >The choice of an application solution that is flexible, scalable, and integrated. 10 or 15 years ago, companies tended to position costing within the accounting ERP itself, which was complicated, costly, and, at the end of the day, often disappointing. For the last 10 years, editors have been putting on the market tools that are dedicated to costing and are much more efficient in terms of calculation times and the management of large volumes and repositories. They come in the form of an application brick which, as an add-in to the ERP, provides traceability of costs and enables them to be analyzed in detail, whilst remaining connected to the accounting system. The modelling capabilities of these new tools, the fact that they are easy to get to grips with, and their flexibility are all significant advantages in terms of developing the model and ensuring the success of the initiative over time. The choice of an application solution that is flexible, scalable, and integrated. 10 or 15 years ago, companies tended to position costing within the accounting ERP itself, which was complicated, costly, and, at the end of the day, often disappointing. For the last 10 years, editors have been putting on the market tools that are dedicated to costing and are much more efficient in terms of calculation times and the management of large volumes and repositories. They come in the form of an application brick which, as an add-in to the ERP, provides traceability of costs and enables them to be analyzed in detail, whilst remaining connected to the accounting system. The modelling capabilities of these new tools, the fact that they are easy to get to grips with, and their flexibility are all significant advantages in terms of developing the model and ensuring the success of the initiative over time. The ABC method forces you to change your perception, take a step back, and work on synchronized and shared repositories. It requires rigor in the communication of figures, but provides fact-based levers for improving the daily management of operations and performance. Finally, while costing is undeniably a powerful decision support tool, this can only really be the case if the model is defined with regard to the challenge intended to be addressed. You do not build the same model to meet simulation challenges as you would to provide regulatory reporting, or enable operational steering, or calculate the profitability of new products. It is therefore essential to take the time to clarify the main objective, as well as the granularity and depth of the desired elements. It is better to build several costing models rather than seek the universal model: it does not exist. David Hatchuel is Senior Manager within Keyrus Management. Holding post-graduate diplomas in Finance from Dauphine University and in Accounting, he has 18 years' experience, both as an operational management controller in an industrial group, and as a consultant in major firms. He assists with the transformation of finance departments, working on their projects to develop information systems, improve the effectiveness of finance functions, and manage performance. Keyrus Management is the Consulting Firm incorporated within the Keyrus Group, which combines business know-how with technological expertise in data management. The complementarity of these two aspects provides an edge in terms of value, and gives Keyrus Management a unique positioning in the consulting landscape. Keyrus Management helps enterprises of all sizes, whether they be Large Accounts or small- and medium-sized companies, to meet their increased needs for rapid transformation by developing their agility and accelerating digital use. The firm is developing its activities in France and internationally, supported by the Keyrus Group, a specialist in Data and Digital present in some 15 countries on 4 continents. The Cigref is a network whose mission is to "develop the ability of major companies to integrate and master digital". It brings together more than 130 major French companies and organizations in all business sectors (banking, insurance, energy, distribution, industry, services…). General Management, Finance, Accounts, Management Controlling, Human Resources, Purchasing, Procurement, Legal, Information System, Project Ownership, Quality, General Resources, Marketing, Sales, Customer Relations, CSR. Service Level Agreement: agreement/commitment on service level.